A beautiful splash page of 2010 Cyborg Superman original art by Death of Superman artist Dan Jurgens! This is the original splash page art to Booster Gold # 28, page 20 and features Cyborg Superman (Hank Henshaw) and Michelle Carter! On this page: Booster Gold's sister, Michelle Carter, has traveled back in time to just after the Death of Superman and during the Reign of the Supermen! 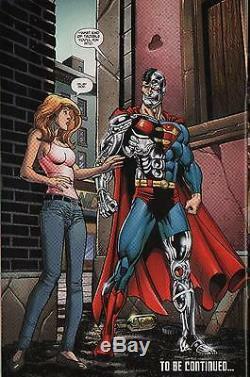 She arrives in Coast City and can't shake the feeling that something terrible is about to happen when she stumbles across the Cyborg Superman! See color scan of published page for more. The art on this splash page was penciled by Death of Superman writer/ artist and Cyborg Superman co-creator Dan Jurgens and inked by John Stanisci. PLEASE NOTE: This is an original, hand drawn piece of published Cyborg Superman original art, not a copy or facsimile! This 11 X 17 inch page of art on bristol board is in excellent condition and would make a great addition to any Cyborg Superman, Dan Jurgens or John Stanisci collection! It could also make a GREAT GIFT! These charges are the buyers responsibility. And, check out my other auctions for great original comic book art! 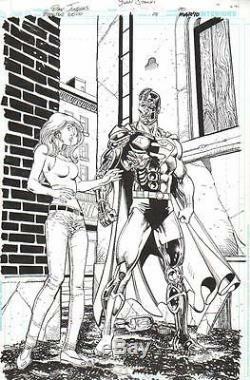 The item "CYBORG SUPERMAN SPLASH ORIGINAL ART, DAN JURGENS-2010-FREE SHIPPING" is in sale since Monday, December 19, 2016. This item is in the category "Collectibles\Comics\Original Comic Art\Splash Pages". The seller is "stevo861" and is located in Fort Lauderdale, Florida. This item can be shipped worldwide.